Above you will find a handy chart relating specific FFA of extra virgin olive oil to its smoke point. However, FFA as it relates to the smoke point of an extra virgin olive oil is not the end of the story. The phenols found in fresh extra virgin olive oil also protect the oil from forming aldehydes which are more or less toxic to our cells, whether we eat them or inhale them while cooking. Aldehydes will begin to form in any type of cooking oil as soon as it begins to oxidize as a result of being heated up, and are increased when an oil is heated for a long duration or at very high temperatures. The phenols (antioxidants) unique to fresh, well made extra virgin olive oil “sacrifice” themselves to this heat oxidation thus preventing or diminishing the formation of toxic aldehydes, which makes a strong, if not iron clad case for exclusively cooking with high phenol, low FFA extra virgin olive oil above all other cooking oil options available. Beyond this, when we use high phenol olive oil for higher heat applications, we may still be left with some phenols and of course the flavor they impart, which does not speak strictly to the prevention of bad compounds, but also addresses the sensory and health benefits unique to fresh, well made EVOO. 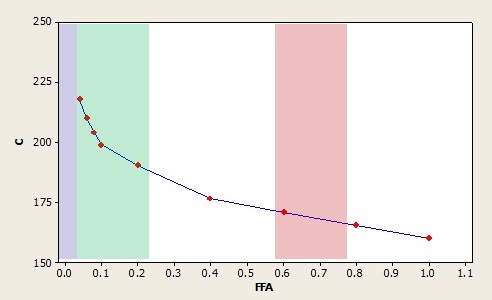 The following diagram shows the influence of FFA on the smoke point of an extra virgin olive oil. The green band shows the smoke point range of good quality low acidity extra virgin olive oil. The pink band shows the smoke point of lower quality high acidity oils. In culinary terms, these real differences are huge!